The march took a short jog to the right going to Rue Notre Dame and moved within a block of the Place d’Armes and suddenly the march quieted as they entered the plaza in front of the Basilica de Notre Dame. Slowly we strolled across the plaza, meandering right and left, as if we were a 250 person tourist group on a first time visit. 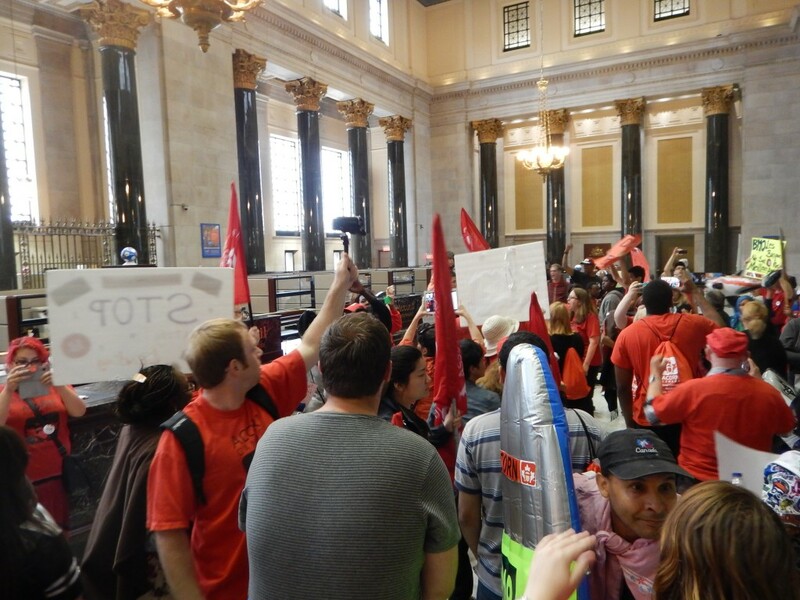 A delegation of leaders had already proceeded the march and were now in the lobby of the Bank of Montreal. Another delegation of more than a score had split off from the ranks of the marchers and were moving unseen behind another bank that fronted the Place d’Armes. 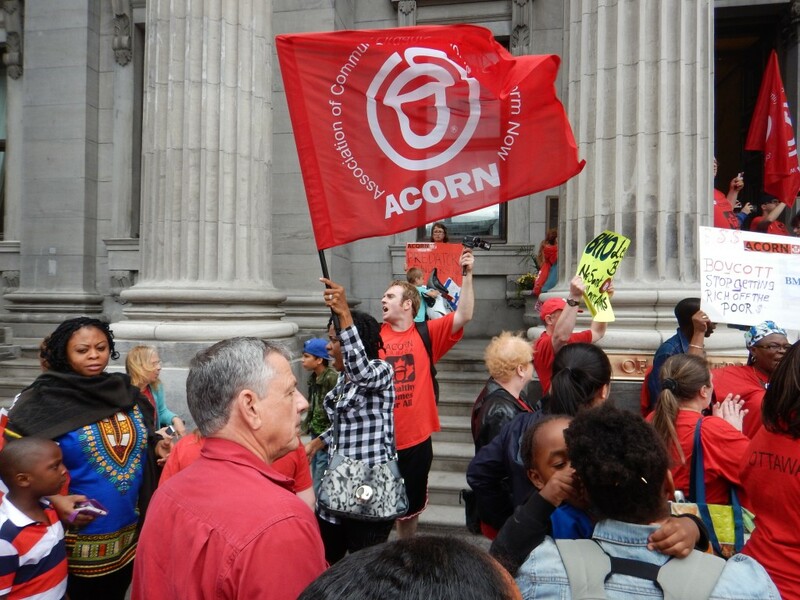 When the march line reached the street in from of BMO, as the light changed, the members followed the banner quickly across the street up the front steps and through the doors being held by designated members and organizers to ease their entry. 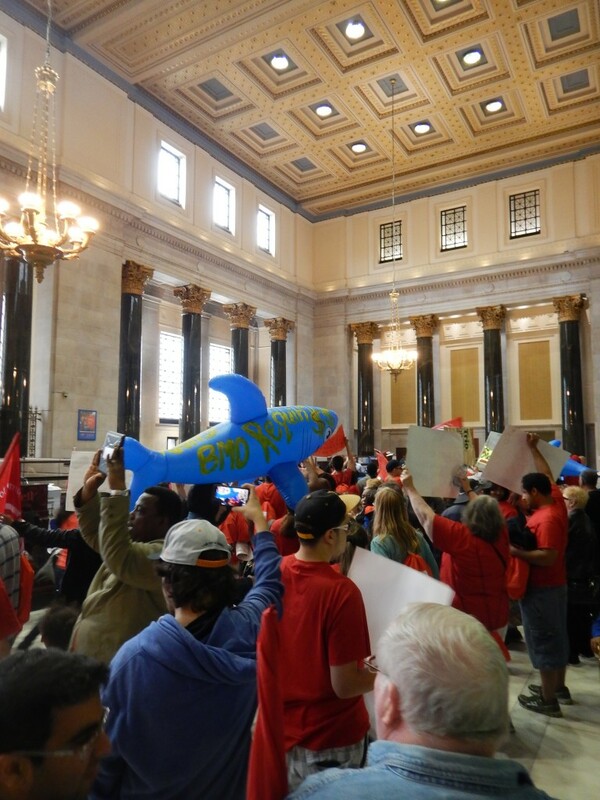 Simultaneously, another group went through the other door so that could pass the bank’s own museum and meet the leaders and other marches entering the lobby. We had observed the security several days earlier and though in evidence, the BMO security team was both lighter and older than we expected on each door. We had hoped to get perhaps fifty of the members inside and rally with the rest outside. If we were quick, well-organized, and executed perfectly, perhaps we could get half of the crowd in. This was the 21st century after all, no one could do better than that. The days of being able to get more than 1000 in the Citibank headquarters on Park Avenue in New York City as we had done in a memorable convention years before were long gone. 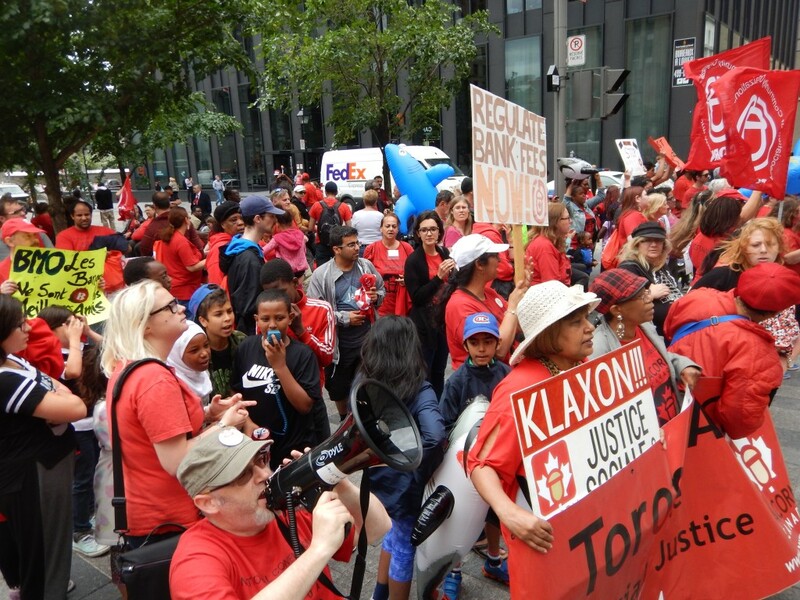 Security met the first protestors with waves of “No, no, no” and then moved out of the way as ACORN members passed by them without hesitation, now taking up their chants with fervor and carrying a dozen sharks over their heads, symbolizing predatory lending at BMO. The police outside came bounding up the steps but were left standing helplessly behind members crowding through the circular door. Other marchers were rerouted to the second door around the police, and when the police entered the building the rest of the marchers were hustled through the main door behind them. Within minutes all the members found themselves chanting as they looked at the marble counters and columns, so shiny they could be used as mirrors, and the forests of dark work soaring to almost forty feet to what appeared to be a gold leaf ceiling throughout. Once the police were inside with us and officers from the bank agreed to take the letter from the leaders to stop their predatory lending and their extensive investments in payday lenders, long a target of ACORN Canada, the ACORN members found themselves back in the plaza chanting and smiling, high-fiving and hugging, knowing they had delivered their message powerfully, and they had all been part of an action they would never forget. Toronto Preparing to meet with the ACORN International “intern army,” as I call them, at George Brown College today, I couldn’t help but laugh while using the Starbucks internet (thanks, fellas!) when I read that Jamie Dimon of JP Morgan Chase was over at Davos complaining about “banker bashing” and France’s President Sarkozy was forced to gently remind him that more than 10,000,000 people were still looking for work because of their shenanigans. Whose on first, what’s on second? Which brings me to banks and money transfer organizations at the heart of ACORN International’s Remittance Justice Camapign, where it turns out that almost know one is on any base at all. It seems no wonder that the charges banks and MTOs have larded onto immigrant families efforts to send money to relatives in the home country are so predatory, because from our early research it appears that there is virtually no effort to regulate the movement of these payments at all. Of course there are some new post 9-11 efforts to hand slap some transactions to slow down terrorism, but nothing that would pay more than lip service to the predatory charges, fees, and exchange rates tacked on to remittances (see our report and sign the petition of support at www.remittancejustice.org). National central banks are nominally in charge of regulating the kind of banks that Dimon thinks are being bashed, but have been silent or stumbling at best in even looking at the problems of consumers and costs. The United States Federal Reserve Bank has proven this time and time in so many areas of banking endeavor that this should come as no surprise. The Atlanta region is piloting an international automatic clearing house function so that businesses can move money more easily to Europe, but nothing for consumers. In Canada and the United States there is a patchwork quilt of confusion, where money transfer organizations like Western Union, MoneyGram and the scores of other outfits that have sprung up are nominally under the authority of individual states or provinces, many of which do little other than collect operating fees, but certainly don’t pretend to regulate these outfits and their cost structure. In some cases they worry that they may share authority for regulations, so the quandary is even more pronounced. The situation is more than a mess, it’s a pathetic tragedy costing immigrant working families billions that simply end up in the pockets of the much maligned financial industry. We seem to have little choice but to open up another front to move for regulations wherever we can get a hearing, while continuing to press the MTOs and bankers to do the right thing, which as Chase’s Dimon seems to indicate has about the same chance as a snowball in hell of moving bankers and their buddies.